To see the Bungle Bungles we left our caravan at Kununurra and took the Landcruiser with roof-top tent. 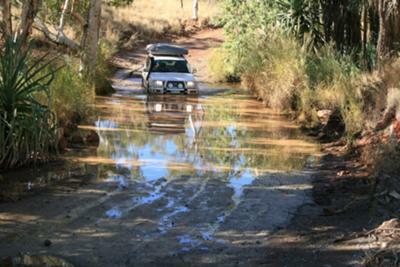 We needed one day to travel from Kununurra and a few hours for the track in. We camped one night. Camping in the Bungles is very basic and you will need your own fresh drinking water. No showers, pit toilets and a tap with non-drinking water. We spent one day looking at Piccaninny Gorge and that area. We then camped the night in the other camping area and explored the Cathedral area the next day. We did this walk early before it was too hot and then left at lunch time for the long drive out. The road in was very rough - some drivers took it carefully and there was no problem but others drove like bats out of hell. There were damaged vehicles and a camper trailer which had removed itself from it's chassis. I would not like to do this road if the creeks are high after rain. I don't believe you would need more that 2 days to explore, but leave plenty of time to drive out (and in) before dark. It is well worth the effort and is one of our two most fantastic places to visit! The other incredible place is Arkaroola. Thanks for your article. Great photo. That's funny, it is exactly the same creek crossing as in my top banner! I have the whole photo here, so I can tell :-). Join in and write your own page! It's easy to do. How? Simply click here to return to Bungle Bungles / Purnululu.